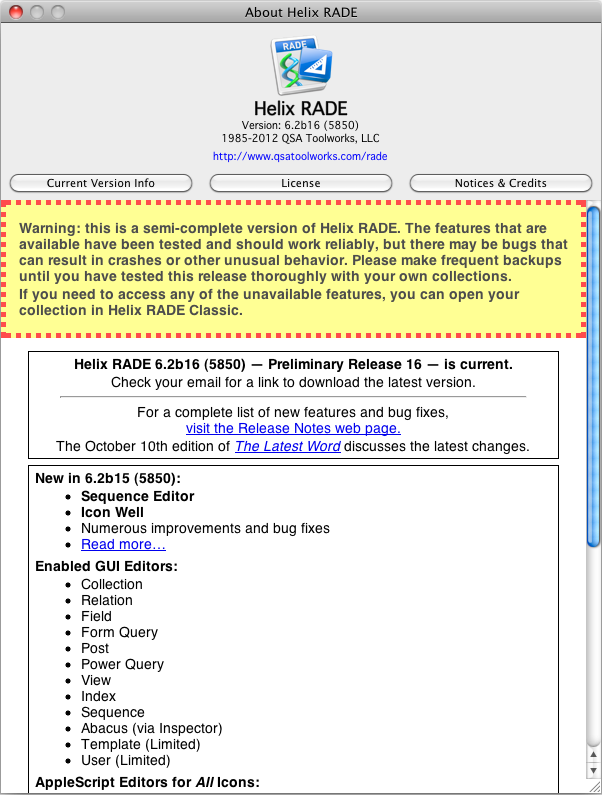 10 October 2012 — Excellent progress continues with the sixteenth Preliminary Release of Helix RADE 6.2 for macOS available today. If you aren’t receiving those emails, perhaps your spam filter is working overtime, or maybe you didn’t respond to our emails and calls asking you to renew after your ‘first year’ subscription expired. Regardless of the reason, if you are not receiving monthly emails informing you of how to download the latest updates, please contact us so we can get you back in the game. For those who haven’t joined us yet, you can still participate via the monthly installment plan, for an initial payment of just $200.00, followed by 7 monthly payments of $40.00. Or you can pay $440.00 and get every update we release until May 31, 2013. We’re still committed to monthly releases, so that’s 7 more updates delivered to you automatically. If you did not install the new Helix Utility last month, you must — one last time — open the “Helix Diagnostics” folder and drag Helix Utility to your Applications folder. Once you’ve done that, you can eject the disk image and go to work. In addition to some exciting new graphic user interface improvements, there are numerous bug fixes and other tweaks in this release. An example some of you will find very useful is the ability to perform a Copy to Volume command by dragging a document icon from Helix to the desktop. There are a few nice new tweaks in the Inspector window. One shows the “parent” of an icon; that is, where it resides in your collection. This becomes very useful when clicking through the icons in a “Used by” window. Another shows the query expression (using the Abacus Expression Language) for an entry view. Before we jump into what pieces of Helix’s graphic user interface have arrived back in the visual fold, so to speak, we want to welcome back everyone who may have been unaware of what’s been going on of late. Welcome back? Who? What? Why? How? Where would we ever get the idea that anyone with an interest in Helix has been missing this news? After all, we have published a new edition of The Latest Word on or about the 10th of every month since Europa began, have we not? Long ago we learned that just doing that is not enough. And we understand that even Helix users have much better things to do with their time than checking our website every day for news of a new posting. So we took to emailing notices of new editions of The Latest Word to anyone who had indicated on their Helix customer record that they wanted news. That is, just until sometime after we began Europa, it would appear. Then something happened. Something that probably had to do with our zeal to confine information about Europa to those who support it with their hard-earned money. As a result, we now must offer an apology, and a welcome back, to everyone else out there who may still be using Helix and may still be waiting for us to finish, not supporting the effort financially for whatever reasons you may have, but possibly also intending at some point to step on the train. It appears that for quite some time now, those emails that announce new editions of The Latest Word have only been going to Europa Pioneers. We have not been intentionally avoiding you! We want you to know about the great progress we have been making. In fact, we want everyone to know. By now you may have surmised that we failed or gave up and went home. We didn’t. With today’s release, we have corrected that problem and assure you that it will not happen again. Helix is alive and moving toward completion for macOS, as you will read in a moment (and if you have just joined us again after many months, please read up on all you have missed since the last time you were here). Last month, to moderate fanfare, we introduced the Element Panel. But its use was limited to just the index editor. When any other window was open, it was blank. We attempted to assure you that the Element Panel would eventually do more. There weren’t that many different editor windows that you could open last month, and only a relative handful of new ones will make their debuts by the time we are done. But the collection and relation windows have been there all along. When we first implemented those, we created menu items for making new icons since we didn’t have a place from which to drag icons. But now we have this shiny new panel designed specifically for dragging and dropping icons, and it seemed only natural that one should be able to drag and drop icons into a collection or relation window, like we used to do in Classic when dragging from an icon well. 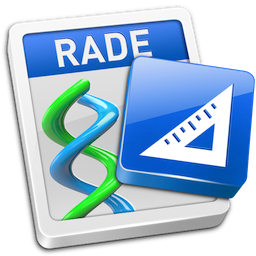 And so, in Helix RADE 6.2 Preliminary Release 16, we once again have icon wells. We’re still going to refer to the source of new icons as the Element Panel, but we’ve taken it to its natural conclusion, and you can now drag and drop objects as appropriate from the Element Panel. Call us crazy about drag-and-drop, but as we got further and further along with the Element Panel, it occurred to us that if we could drag and drop from there, why not drag and drop from other windows as well? And wouldn’t you know it? Now Helix RADE will let you do that too! It also dawned on us that a perfectly logical extension of this behavior would be to allow you to drag and drop icons between relation window as another means of copying and pasting structure. And it is, but not quite yet. That project turned out to be a little longer than we had time for this time around. But it is coming! And we mean anywhere...including from the "Where used" window (which is not shown in the video below). Last month, when we introduced the Element Panel, we showed how it would work by means of also waking up the index editor. We said at the time that the Element Panel would simplify the rest of the projects we need to complete. This month brings the next step in that evolutionary process, showing how that same new Helix graphic interface can be applied to another key Helix icon: the sequence. As with most Helix objects opened in macOS, some of the work is done in the Inspector. In the case of the sequence, you have actually been able to do most of that for some time now. Things like specifying error message text, or what happens with dialogs. But some icons require, as they always have in Helix, additional screens where input is required. In the sequence editing process, that window is where the steps in the sequence are dragged out and, if necessary, reordered by drag-and-drop. Here is where you can see the integration of features quite clearly. When you have the sequence editor open, if you want to add an existing view, user or sequence to your sequence, you can now select the appropriate column in the Element Panel and drag there, or you can drag a view directly from a relation window and a sequence or user icon directly from the collection window. And as with the index editor, when you drag anything back out of a sequence window, it will ‘crumple up’ and disappear, provided that you drag it over the Element Panel or Inspector. A future feature will tack itself right here so please bear with the location restrictions for now. One thing we neglected to point out about the index editor last month, which will also now apply to the sequence, is that old index and sequence windows, if not moved from their default screen locations, will appear at least partially obscured by the Element Panel. Any new icon, i.e., created in macOS RADE, will, when double-clicked, open its editor window to the right of the Element Panel so it is not obscured. A script that repositions all pre-existing Design Mode windows to compensate for the Element Panel is available on our free scripts page. Last month, we said that Preliminary Release 17 would bring the template at last and in fact it will, but just not all at once. We have known since Europa began, in fact, way before that, that building a new template and abacus would take significantly longer than a month each. But it is our intention to have the template editor functional by year end, leaving us only the abacus and user editors, some document work and View by Icon to complete in 2013. Even though the template will take longer than a month to complete, our plan is to make it available in stages. You might, for instance, be able to simply view your template and adjust some of its properties with the Inspector in the first month, before actually being able to build new template structure. If you still have not yet joined us, and you’re waiting until the work is all done, again we must remind you that we really could use your financial support. It only gets more expensive — in both time and money — not just for you, but for everyone, the longer you wait. Please don’t wait any longer. Join Europa today and help us get to the finish line with a little less stress and strain! Finally, an update on the aforementioned View by Icon project. We now have nearly enough verbal commitments to make this dream come true. We will be contacting those who have stepped up in the next week or so. There is still time to join this particular effort. If another week or two go by and you have not heard directly from Gil, you can safely assume that your attempt to volunteer has fallen through the cracks and you must contact him again. Don’t be deterred if this feature is important to you. While volunteering to help does not commit you to any particular dollar amount, the time to ante up is nigh. We’re still building the team that will bring this vital part of Helix back. If you’re in the camp that wants this feature restored, contact Gil.